NBC's Tuesday night Olympics coverage featured more heroics from Simone Biles and Aly Raisman on what was the final night of the gymnastics competition. Unfortunately, the network also televised what would end up being a rough loss for U.S. women's beach volleyball star Kerri Walsh Jennings and teammate April Ross. 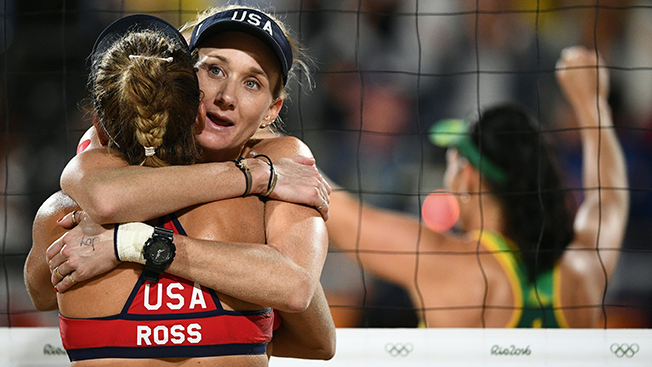 Walsh Jennings was denied her fourth straight beach volleyball gold medal in a semifinal loss to Brazil. The gymnastics events were televised on tape delay during NBC's prime-time broadcast, but the beach volleyball match was shown live. The Tuesday prime-time action delivered an average of 25.6 million total viewers but only a 14.3 household rating across broadcast, cable and digital. Tuesday was even with Monday in terms of total viewers but down 4 percent in households. The 14.3 is the lowest household rating since the first Saturday of the Rio Games. Also in prime time on Monday, NBCSN's live Olympics competition coverage averaged 1.21 million viewers. The sports network has averaged 1.41 million viewers for its extended prime-time coverage (7 p.m.-midnight ET) for the 11 days of competition—Saturday, Aug. 6 to Tuesday, Aug. 16—accounting for the best 11-day prime-time stretch in its history. The final day of the gymnastics competition delivered 554,000 unique users on NBCOlympics.com and the NBC Sports app, making it the top Tuesday night event. The top local markets for NBC Olympics Tuesday night were of course Salt Lake (20.5), followed by Denver (19.8), Austin (19.5), Columbus (18.7) and Richmond, Va. (18.2).